Happy Holidays!! (Note: I prefer to wish everyone, no matter what their spiritual outlook, a happy time as they celebrate their own beliefs -- just saying.) Anyway -- No matter what you celebrate, this is traditionally a season of gratitude, and I think nonfiction writers have a lot to be grateful for these days. I could start with the Common Core, but that may or may not become a boon to our business. Instead I am grateful for a job that allowed me to stay home with my children for 20 years. Yikes! When I say it like that it seems like a long time, but boy did it go quickly. I'm grateful for the technology that allows me to write and revise so easily. I remember my Mom, Margery Facklam, writing her first books using carbon paper and a typewriter. I wonder if she was more thoughtful in her revisions compared to me who goes back and forth with a click of a key. Plus, she actually knew how many times she revised. I'm just constantly revising. I am thankful for a community of writers who support one another. Children's writers are, by far, the most supportive people I know. We don't think of other writers as competition. They are colleagues struggling with the same difficulties. I'm thankful for true stories unveiling themselves everyday - in the news, in my life, in other books. For the Internet that makes preliminary research effortless, and puts experts in my living room. I'm grateful for new purple pens. And new notebooks with gleaming white pages. 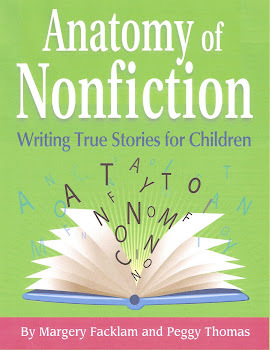 For libraries and librarians, and especially kids who love reading nonfiction. Last week Jim Murphy wrote an excellent INK blog( http://inkrethink.blogspot.com/2012/12/a-tiny-bit-worried.html) voicing his worry that writers will write to the Common Core Standards. He has a point. After all, there is not one nonfiction writer that I know who didn't cheer when they read the part about kids reading 50% nonfiction and 70% by the senior year. We didn't bother to read further. We have all been infected in some way with the Writer's Common Core Syndrome where your mind is taken up by the Common Core wondering if your work- in-progress will “fit” the standards, or you may spend more time thinking up classroom activities and lesson plans that can be used with your old books than time writing a new book. The Common Core is a standard for teaching, not for writing. That’s right. It is a standard for teachers and school districts not for us. If we want to “fit” into CC all we need to do is continue to write the great nonfiction that we are writing. I cheered when I read the CC because I saw it as an invitation to Science teachers to put down their text books and read my book FOR THE BIRDS: THE STORY OF ROGER TORY PETERSON to introduce a lesson on nature observation, or an Art teacher might use it to introduce a drawing lesson. 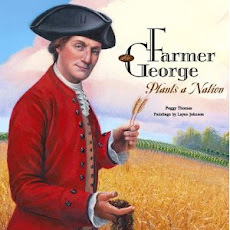 Social Studies teachers might use FARMER GEORGE PLANTS A NATION to illustrate the importance of breaking away from England, or Science teachers might use it to discuss composting or to introduce a seed experiment. I’m not a teacher, but my mind reeled with the images of my books being read in a variety of classrooms, not just sitting in the nonfiction section of the library (where there may or may not be a librarian). It really is that simple. CC wants kids to read REAL STUFF! Not manufactured, one-size-fits-all text books that leave no room for discussion or imagination. Books are not meant to linger in English class, but are meant to inhabit ALL classrooms. And Writers? You need to write REAL STUFF!! Do that, and your books, magazine articles and newspaper columns will always be a perfect fit. Nonfiction Writers Anonymous - "Hi I'm Tom King and I write Nonfiction"
I had been listening to the radio – Q on the CBC -- when I heard an appalling comment. I thought I heard Tom King, author of Inconvenient Indian and many other fabulous books say that reading nonfiction was like herding porcupines with your elbows. AHHH!!! My mind reeled and I started in on a head-rant about how its people like him that makes my job seem second rate to fiction writers. “Reading nonfiction – Oooh, Painful – too many facts – yuck!” How dare he! But before I made my head-rant public I listened to the rest of the program, and I looked up a few things about Tom King. The first thing I learned is that he actually said, “WRITING nonfiction is like herding porcupines with your elbows.” And that statement I can relate to. You do have to wrangle disparate accounts into place, and that sometimes can be prickly business. The second thing I learned is that Tom King is an award-winning author of several books, a college professor, actor and activist. He was nominated for the Governor-General’s Award twice and in 2004 awarded the Order of Canada. No slub. And no stranger to nonfiction. Sort of??? Is it true or not? All true and nothing but the truth?? Then why waffle? Now that sounds like a nonfiction book I want to read -- a nonfiction book that raises the bar; a NF book that other NF books can aspire to; a NF book that can walk into a library and make all other NF books shudder with envy. If I wrote that kind of nonfiction book, I’d be hollering from the rooftop and calling myself the new Truman Capote. OH! A History. Well – that’s different – never mind! The other day I had my first Skype session with college students. Of course there were technical glitches - I couldn't hear them - but after a few minutes, switching laptops and tossing the dogs upstairs, I finally connected with some of our future science teachers in Wyoming. What could I possibly tell them? What did I think they should know about nonfiction books? I discussed how most nonfiction books (at least mine) are written to satisfy the author. We're curious people, constantly asking why, where, what, how, and getting excited by a topic until we have to say, "Hey look what I learned." I mentioned that good nonfiction isn't a regurgitation of general facts, but a thoughtful presentation of stories woven together to create a full picture of an event or a life or a concept. I can’t remember who said it at the NSTA conference last year, but someone said it beautifully when asked what the difference was between text books and nonfiction – the answer came down to two things – the passion of the author, and that text books leave you with no questions, while nonfiction leaves you wanting to know more. I didn't say it beautifully, but you get the gist -- Good nonfiction inspires, excites, it leaves room for the reader to imagine, question, explore. I also babbled on about the Common Core and how NF writers are excited to have this opportunity open up in the curriculum. Writers and librarians have known forever how to use our books in the classroom, but the sad reality is that it is easier and sometimes mandated to use text books. And what's ironic about that, is that most text book companies these days purchase the rights to reprint sections of writer's award-winning NF books and magazine articles, so kids are reading quality writing, but the they are hand-fed the questions and the answers so there is no room for imagination and exploration. I think I mentioned that teachers and writers should work together more because we do what teachers and students are asked to do everyday. We look for information, evaluate it, put it in some kind of context, then use that information, expand on it, combine it in a new, clear, thoughtful way. We can show kids how this process works – that it can be fun – and some weird people like me love doing it -- and that one style does not fit all as might be mentioned in some text books – there are many ways to do research, many ways to write, and many ways to share that writing. After rambling for a bit the students asked questions. Where do you get your ideas? How long does it take to make a book? I sighed and realized that what I do for a living is just as mysterious to others as knowing how to fix a car is to me. No matter who your audience is, start at the beginning.